There are about 200 golf courses in the greater Phoenix area. You can pay a couple hundred bucks for a round of golf, but sometimes you just don't want to pay that much. We have some very enjoyable courses in the Valley of the Sun where you can play 18 holes for less than $50--and sometimes quite a bit less than that. Don't forget that just about all the golf courses in the Phoenix area offer twilight rates, too. Note: These are generally November and December prices. Prices may be higher in the winter and lower in the summer. Call to inquire about course maintenance schedule, especially in November. Just about every one of the course listed below offers discounted rates through GolfNow.com. Located in Surprise, northwest of Phoenix. It's 6,213 yards and follows the Agua Fria riverbed. Views of the White Tank and Bradshaw mountains, undulating fairways and a variety of putting surfaces are found at Coyote Lakes. Also located in the northwest part of town in Surprise, this is a par 70, 6,235 yards. The signature hole is the #5, par 4. 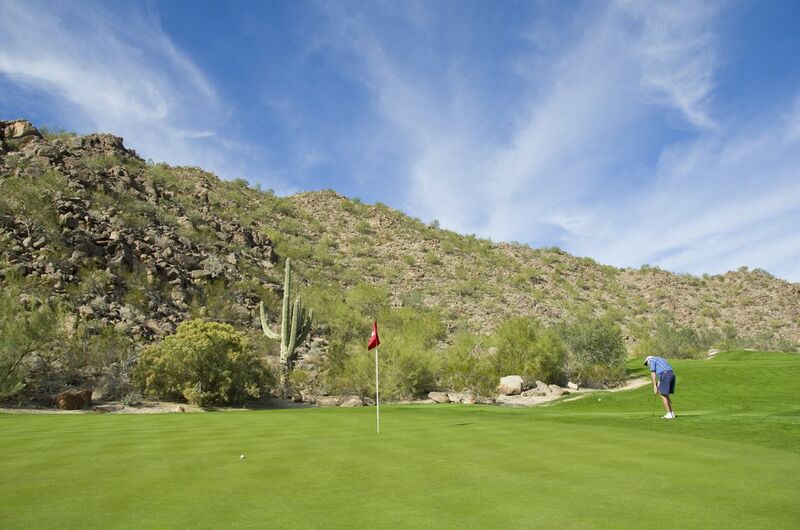 Arizona Traditions boasts rolling fairways, undulating greens, and mountain views. A City of Phoenix public course, Encanto is located in Central Phoenix and is the third oldest golf course in Arizona. Level fairways and not too much trouble makes Encanto a good course for all levels of golfers. On the southwest side of town in Goodyear, this course is rated as one of the best public golf courses. The 18 hole championship course is the Palms Course. It's a par 72 course with yardage just over 7,000. The signature hole at Palm Valley is the par 5 9th hole. One of the newer City of Phoenix public golf courses, Aguila offers mountain and downtown Phoenix views. It's suitable for all levels of golfer. Par 72, just short of 7,000 yards. Southwest of Phoenix, Aguila is located in Laveen. Goodyear, in the southwest valley. Estrella Mountain has rolling, tree-lined fairways. Par 71, about 6,800 yards from the back tees. Plays in 4 hours or less. A traditional course built in 1962. Located in the far, southeast part of town in Apache Junction. Open fairways. You can get good bunker practice here! It's a par 71, about 6,300 yards from the back tees. Pro shop, grill, driving range, and practices greens--it's all there.